The flooded Odzi River in Zimbabwe. Zimbabwe has started receiving support from countries in the region and far afield, with a planeload of assistance arriving yesterday from Tanzania while a huge consignment is due to arrive this morning from Abu Dhabi, United Arab Emirates. South Africa, Namibia and Angola have also pledged support. Locally, The Herald understands business will hand over an assortment of goods for the President to channel to his stricken people reeling from the deadly effects of Cyclone Idai which has left a trail destruction and death in the eastern and south-western parts of the country. Over 100 people have been confirmed dead, while thousands of others have been displaced, with far more destruction being wrought in the neighbouring countries of Mozambique and Malawi. Speaking in Mutare yesterday, President Mnangagwa said the country had received pledges of support in the form of helicopters, medicines, vehicles among many others with friendly countries responding positively to his calls for assistance in the dark hour. "On Saturday, when I was advised of the destruction in Manicaland, there was not much information. I advised my counterpart in Abu Dhabi that I should go home and address the effects of the cyclone. Our hosts enquired what we required and we sent word back home to be briefed of the requirements. The most likely materials we found necessary included medicines, tents, blankets, motor vehicles and so on," he said. "The ruler of Abu Dhabi promised that he will send these materials that they pledged in three days." The President said the head of the Red Cross Society in Abu Dhabi had already put together these things and they will arrive within three days, minus the vehicles, which would arrive later. He added:"The Tanzanian President (John) Magufuli called me and expressed his condolences. He asked me what assistance they can provide and we gave them a list. A plane will arrive tomorrow with the materials we have mentioned to him. Condolence messages have also come from Angola, Namibia and South Africa. South Africa has provided us with an Air Ambulance as well as a passenger helicopter. We are grateful for all this assistance. "We are aware that South Africa has also been affected by the cyclone and so far we understand that more than 100 people have died. In Mozambique we understand that more than 1 000 people have died and there has been serious devastation and loss of property around Beira." 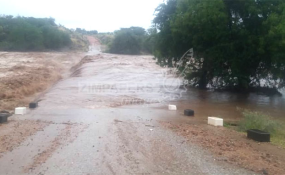 President Mnangagwa said it was fortunate that the mountainous terrain in Manicaland had helped to weaken Cyclone Idai as it moved towards Malawi and back to the sea. "We, according to the weatherman, helped to weaken Idai. We are grateful that we have these mountains because had they not been there, the cyclone would have had a worse impact," he said. And last night, Presidential spokesperson Mr George Charamba, who is also the Deputy Chief Secretary to the President and Cabinet (Presidential Communications), confirmed that a consignment of material from Tanzania had arrived, with support from UAE on the way. "This evening, the President has received a 15-tonne consignment of material for alleviation of cyclone victims from the government of Tanzania," said Mr Charamba. "This is a gift by the people of Zimbabwe through their Government to the people of Zimbabwe through President Mnangagwa. Tomorrow afternoon, the President will be receiving a planeload of materials from United Arab Emirates and this is arising from his recent working visit to that country. The material is a gift from the people of UAE through their humanitarian arm called Red Crescent. It is understood that it will have materials that include medicines, tents and many other things that are required to support the cyclone victims. "I am aware that the President has received two planes from South Africa (helicopters), one which is an air rescue service plane and another which is an all-weather helicopter which had been chartered by a well-wisher. Tomorrow (today) when it's clear, the President will be going to Chimanimani."